The leaves outside our third floor apartment windows are starting to yellow and float to the ground one by one. And in the fall, I start to crave the smell of baking apples and cinnamon. They can try to immitate this smell as many times as they want with candles and plug-ins, but nothing beats the real thing. My first cookbook was Betty Crocker’s Everything You Need To Know To Cook, which I am fairly certain was a gift from my mom when I was in college. I wish I could say I’ve made all of Betty’s recipes, but the truth is I’ve only made a few. 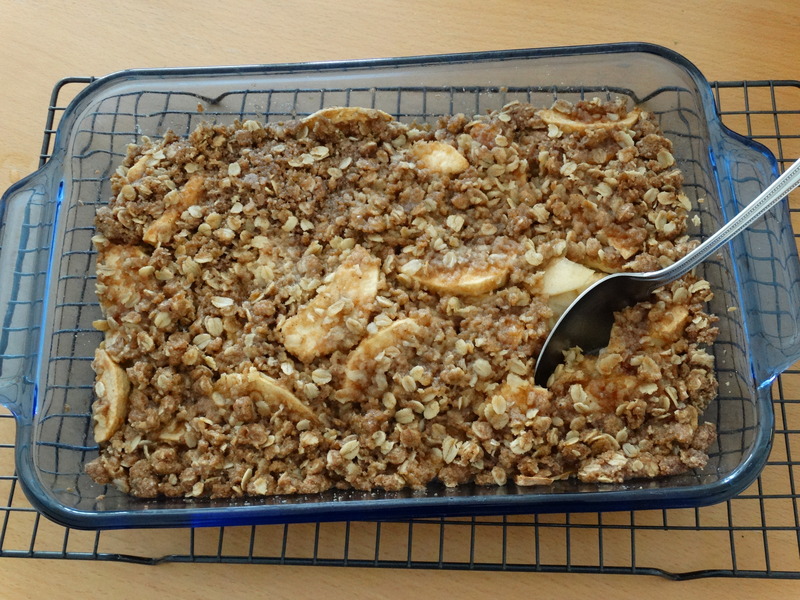 Today, I mostly refer back to it for one recipe: apple crisp. Do you have a favorite apple? Mine has always been autumn-picked McIntosh’s. They are small and soft. Tart, yet sweet. 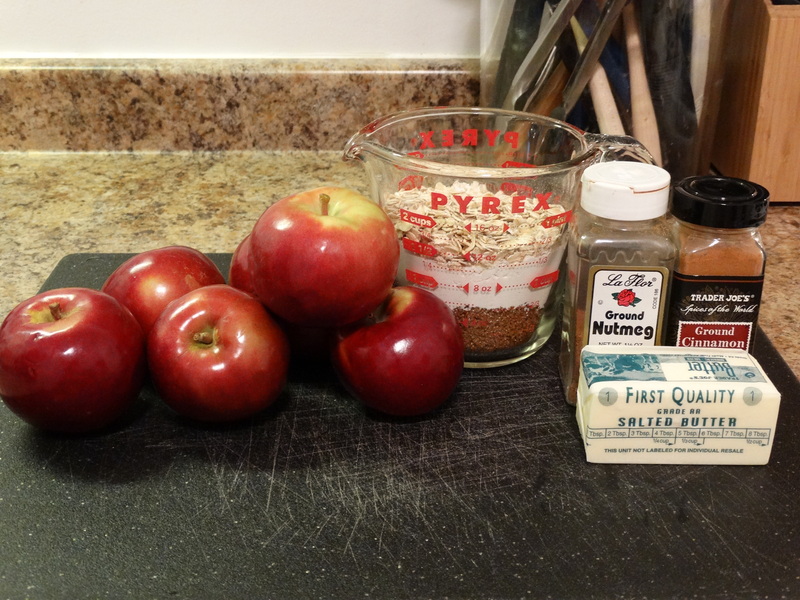 This is the apple that I use when making apple crisp. You can, of course, use any variety you choose. But I do recommend giving McIntosh’s a try! You don’t need many ingredients to make this tasty dessert. 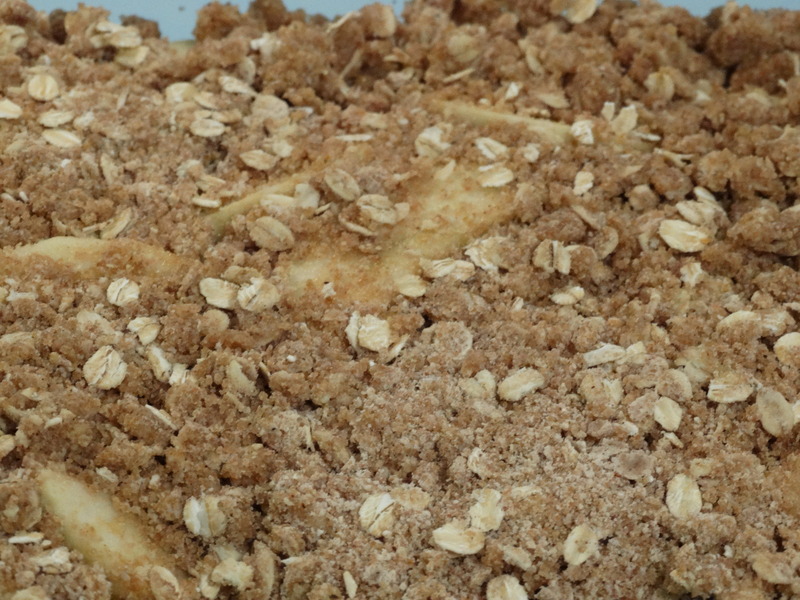 A few apples, some brown sugar, a bit of flour, old-fashioned oats, nutmeg, cinnamon, and of course, butter. Preheat your oven to 375 degrees. Coat an 8″ x 11.5″ baking dish with cooking spray. Wash 6-8 apples. The number of apples you’ll need depends on their size. 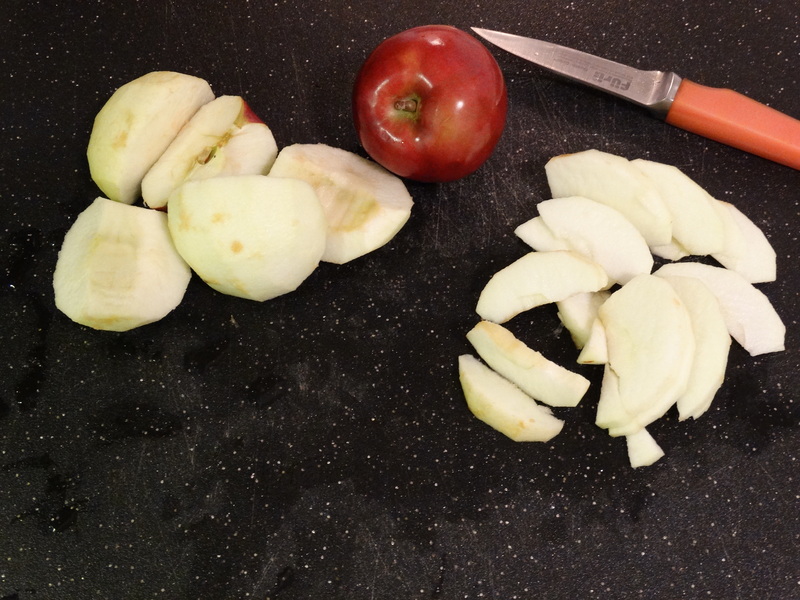 Peel each apple, cut it into quarters, and remove the core. Then slice each quarter into several pieces. Don’t worry about bruises or browning of the apples as they are exposed to the air. They will be covered and cooked, so no one will be able to tell. 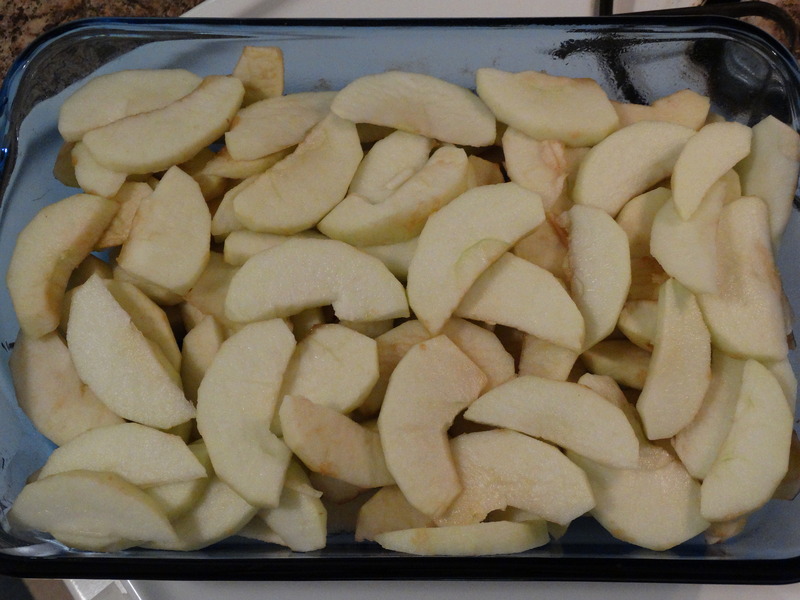 Place the apple slices in your baking dish. Continue adding apples until you are about half an inch from the top. You need to leave room for the delicious crispy topping! 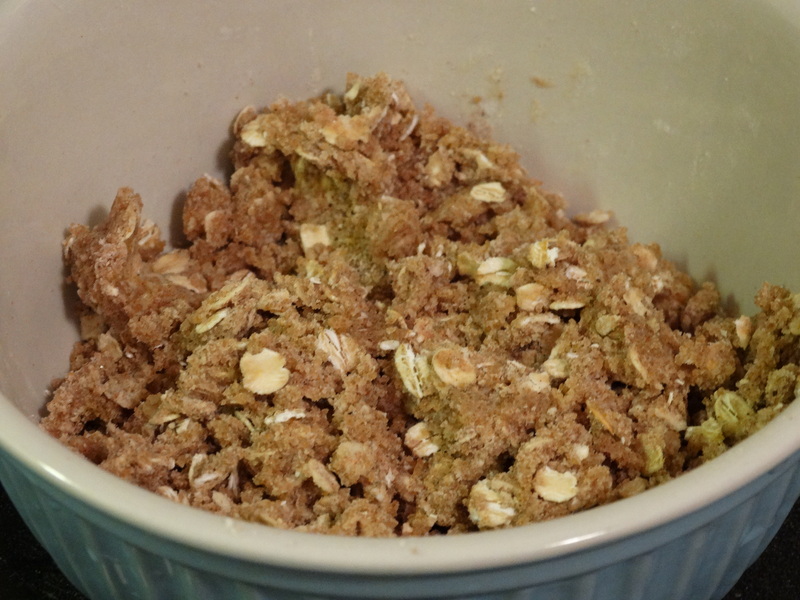 In a small mixing bowl combine 2/3 cup packed brown sugar, 1/2 cup flour, 1/2 cup quick-cooking or old-fashioned oats, 1/3 cup softened butter, 3/4 teaspoon ground cinnamon, and 3/4 teaspoon ground nutmeg. I find that the easiest way to combine the ingredients evenly is by using my hands. Sprinkle the topping over your apples evenly until it is gone. 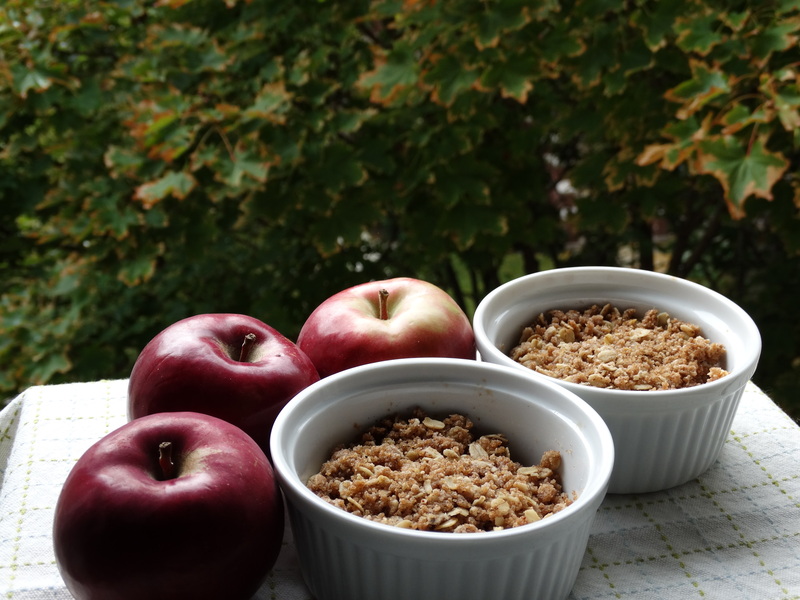 Bake the apple crisp for 30 minutes. Remove it from the oven, allowing it to cool for at least 10 minutes prior to serving. It’s great on its own, but you can get creative. Try it with some caramel sauce or vanilla ice cream. As always, enjoy! 1) Preheat your oven to 375 degrees. Spray an 8″ x 11.5″ baking dish with cooking spray. 2) Wash the apples. Peel each one, cut into quarters, and remove the core. Then slice each quarter into several pieces. Place the apple slices in your baking dish. Continue adding apples until you are about half an inch from the top. 3) In a small mixing bowl combine 2/3 cup packed brown sugar, 1/2 cup flour, 1/2 cup quick-cooking or old-fashioned oats, 1/3 cup softened butter, 3/4 teaspoon ground cinnamon, and 3/4 teaspoon ground nutmeg. Sprinkle the topping over your apples evenly until it is gone. 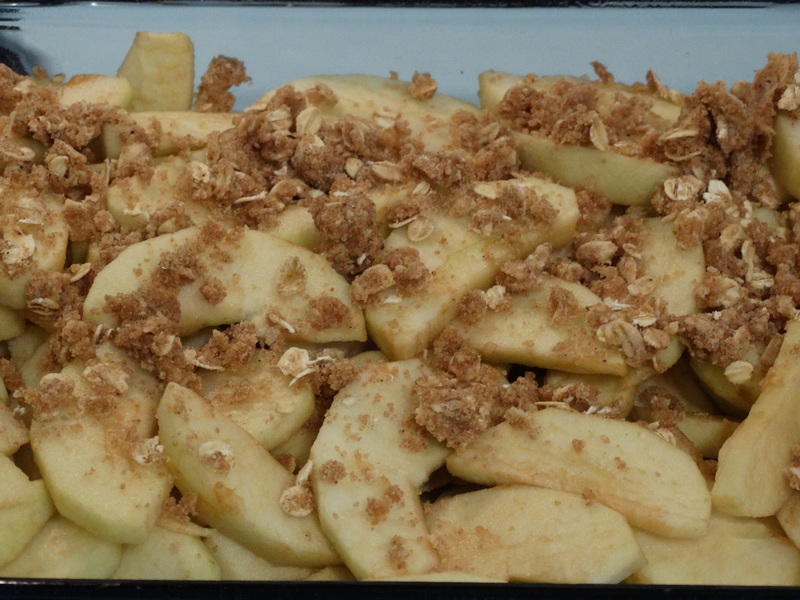 4) Bake the apple crisp for 30 minutes. Remove it from the oven, allowing it to cool for at least 10 minutes prior to serving. Enjoy!